With crisp skin and flesh so tender you can cut it with a spoon, this duck by Paula Wolfert is a masterpiece. She is not a star of the Food Network. She doesn’t own a four-star restaurant that has a three-month wait for reservations. And she doesn’t write pithy food articles laced with expletives and bro-talk that everyone feels the need to read, dissect, and re-post again and again. But Paula Wolfert should be as revered and renowned as any of those folks. More so, even. She is one of the most influential cooks of our time — a woman who has dived deep into authentic Mediterranean cuisine long before most of us ever knew what a cassoulet or tagine was. Over the years, she published eight seminal cookbooks. But when her friend, Emily Kaiser Thelin, a former editor of Food & Wine magazine, pitched the idea of writing a biography of Wolfert, no publisher would give it the green light. So in a modern-day version of a barn-raising, Thelin rallied her friends and colleagues to the mission, recruiting photographer Eric Wolfinger, designer Toni Tajima, and cookbook author Andrea Nguyen to do editing duties. They mounted a Kickstarter campaign, which more than 1,100 folks supported, including yours truly. The result is “Unforgettable: The Bold Flavors of Paula Wolfert’s Renegade Life” (M&P) by Thelin. The title has dual meanings — and hints at why Thelin and her team were so driven to put Wolfert’s life and recipes down in perpetuity. Wolfert was diagnosed with dementia in 2013. The woman who once prided herself on studying up on almost a dozen languages in order to converse with cooks around the world, now finds most of those once familiar foreign phrases elusive. Even reading in English now and retaining its contents is difficult for her. 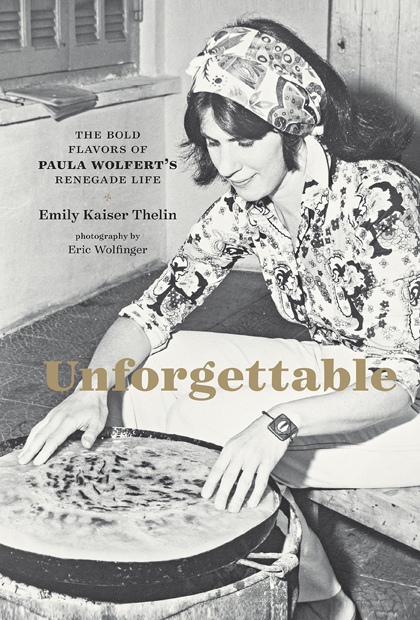 “Unforgettable” is not only a cookbook filled with iconic Wolfert recipes, it is a testament to a life well lived, full of exploration, daring, and conviction. Through recipes such as “Ricotta Cheesecake” (a Wolfert childhood favorite), “Berber Couscous for Spring,” and “Eggplants with Creamy Walnut Spread and Pomegranate Seeds,” you experience the arc of her life and travels. I couldn’t resist trying her recipe for “Duck You Can Eat with A Spoon,” simply because of its irresistible name. 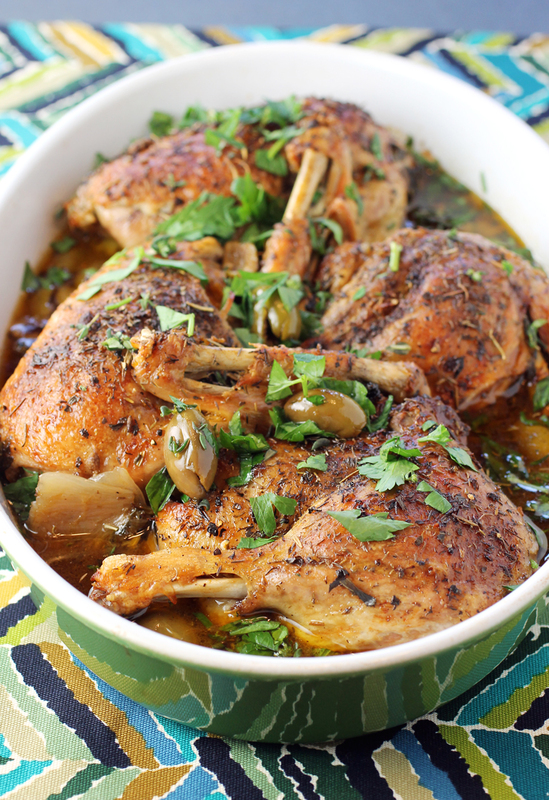 When the recipe header further described it as “Paula Wolfert’s same-day duck confit,” I was sold. You can sometimes find fresh whole duck at Costco, so you don’t have to wait for a frozen one to defrost in your fridge. That’s where I scored my 5-pounder. This is a dish that does take some time to make, but most of it is the unattended three hours or so the duck cooks on low heat in the oven. That’s where the magic happens. The duck, cut into halves and its skin pricked with a fork, then rubbed all over with herbes de Provence, gets arranged on a bed of onions, celery, garlic, bay leaves, parsley and thyme. After three hours, it renders its lovely fat, gets perfumed by all the herbs and vegetables, and ends up so tender and succulent you can cut it with a spoon. The duck pieces get blasted under the broiler until the skin gets crisp. The juices from the baking pan are used to make a pan sauce that gets a big oomph of flavor from the simple trick of caramelizing tomato paste. It adds such a depth and complexity that you’ll want to keep that technique in your arsenal when making any kind of meat sauce from now on. Lastly, the sauce gets fortified with buttery Picholine olives before being spooned around the duck. Can’t get enough of this fabulous duck dish. The duck truly does emerge nearly as rich tasting as confit — without the addition of loads more duck fat to cook it in. The sauce is so delicious, you’ll want crusty bread to sop it up. Or serve a side of cannellini beans to mingle in its powerful savoriness. The lavender, thyme and marjoram sing out loud and clear in this dish. It’s the next best thing to being in the South of France to enjoy grand-mere’s cooking. 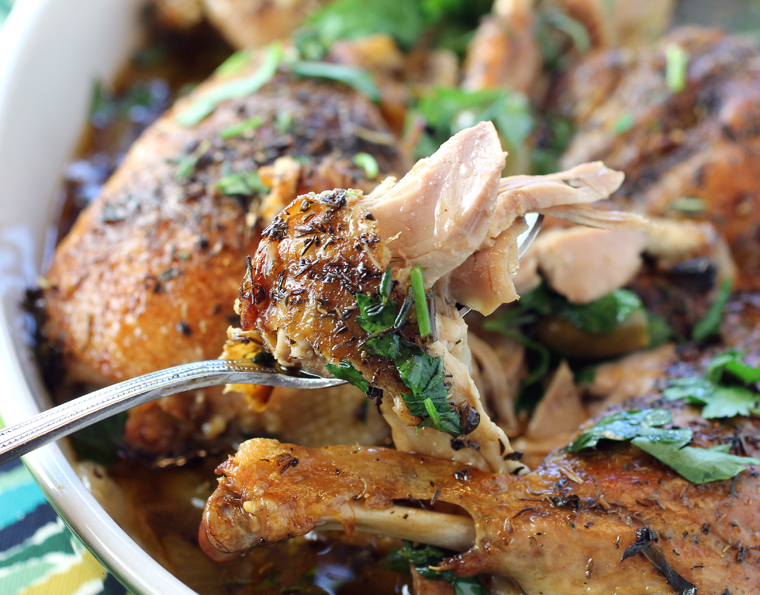 To prepare the duck, in a small bowl, stir together the salt, pepper, and herbes de Provence. Using sharp kitchen shears, cut the duck in half lengthwise along its breastbone and backbone; cut off and reserve the backbone, neck and wing tips for the sauce (or have a butcher do this for you). In a 9-by-13-inch enameled cast-iron or other heavy roasting pan or glass baking dish, make a bed of the onions, celery, garlic, bay leaves, parsley, and thyme, mixing the ingredients well. With the tines of a fork, prick the duck skin every 1/2 inch. Rub the duck halves all over with the herbes de Provence mixture. Set the duck halves, skin side up, on top of the vegetables. Roast the duck, uncovered, for 10 minutes. Lower the oven temperature to 275 degrees, cover the pan or dish with foil, and continue to cook until the meat is very tender and most of the fat has rendered, about 3 hours. Turn off the oven and let the duck cool in the receding heat of the oven for 30 minutes. Meanwhile, begin the sauce. In a 12-inch nonstick frying pan, combine the reserved backbone, neck, and wing tips. Cover and cook over medium-low heat, turning the pieces a few times, until browned, about 20 minutes. Add onion slices, raise the heat to medium, and cook, uncovered, turning the onion slices occasionally, until glazed and nicely browned, about 15 minutes. Pour off the fat from the pan and reserve for another use, such as duck-fat croutons, duck confit, or roast potatoes. Add the tomato paste to the pan and stir to coat the duck pieces. Cook, uncovered, turning the pieces a few times, until they are lightly charred, about 3 minutes. Add the wine, raise the heat to high, and bring to a boil, scraping up any browned bits from the pan bottom. Add the water, stock, and sugar (if using) and bring to a boil. Lower the heat to medium and simmer until the stock is reduced to 1 cup, about 1 hour. Strain the stock through a fine-mesh sieve into a clear glass pitcher or bowl. Skim off the fat from the surface, reserving 1 tablespoon for the sauce and the remainder for another use (as above). Reserve the stock. When the duck is tender, transfer the halves to a work surface. Using kitchen shears or a slicing knife, cut each duck half in half; remove any loose bones, pockets of fat, and vegetable remnants. Transfer the duck quarters, skin side up, to a sheet pan. Strain the juices from the roasting pan through a fine-mesh sieve into a saucepan and discard the contents of the sieve. Skim off any fat from the juices and reserve for another use (as above). Position an oven rack about 10 inches from the heating element and preheat the broiler. Brush the duck skin with the reserved 1 tablespoon fat and season with more salt, pepper, and herbes de Provence. Broil until the duck is hot and the skin is blistering and crisp, 3 to 5 minutes. Spoon the sauce onto a warmed platter and set the duck on top. Garnish with the parsely and thyme, and serve. Wow, that sounds epic. I love duck so this will have to be bookmarked on my copy! Even your pictures look so succulent. I rarely make duck at home because of the fatty mess, but this has gotten me intrigued. Looks like another keeper for a slow-roasting Sunday meal! This slow-roasting duck looks so yummy and so impressive! wow. i don’t eat a lot of duck, but i’ll be darned if that dish doesn’t look more delicious than anything i’ve eaten for a long while!! Thanks Carolyn for this very well written post. I was searching for a way to cook duck long and slow as my husband loves duck confit, but not rare duck breast. This recipe is a good compromise as a means of using the entire duck. I particularly enjoyed reading your interesting but sad history of Paula Wolfert. As a keen cook, I know her name, but do not own any of her books (yet!). Will be trying this recipe tonight. Also looking forward to exploring your blog. With thanks from down under in New Zealand, Carol. Carol: That is so cute about your husband popping into the kitchen so often, tantalized by the aromas. I am so glad you loved the duck. It is such a great recipe. And yes, the olives are a nice little briny touch against the richness of the duck. Enjoy the book. I love it as much for the recipes, as for the spirit behind it.